Please appears on the album Pop. The cover featured a Warholian-style screenprint of leaders of the major parties in the Northern Ireland conflict. 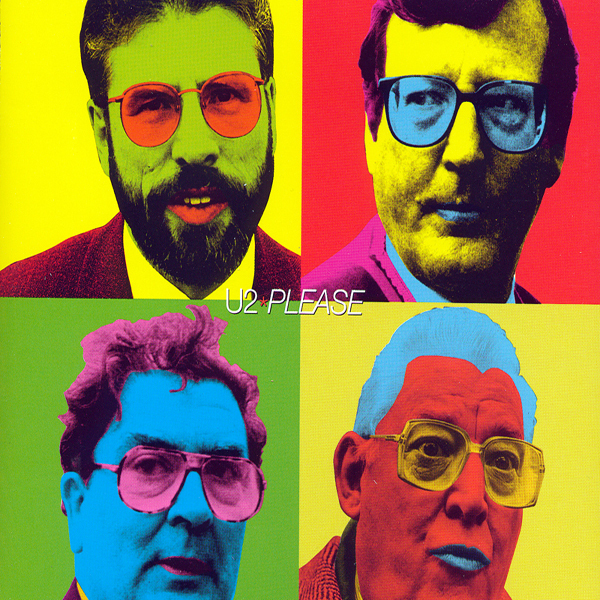 From the upper left, running clockwise: Gerry Adams (head of Sinn Fein), David Trimble (head of the Ulster Unionist Party), John Hume (head of the Social Democrats & Labour Party), and Ian Paisley (head of the Ulster Democratic Unionist Party). The Please (Popheart) EP, released a month earlier, featured the song as performed live in Rotterdam on July 18, 1997. It was performed live for the first time during the PopMart tour opener in Las Vegas on April 25, 1997. It was one of 5 songs played when U2 performed at the Tibetan Freedom Concert on June 8, 1997 on Randall's Island, New York. Bono inserted a snippet of Hallelujah during the performance of the song. The book, Inspirations, is a compilation of handwritten lyrics donated by various artists for the Hits Under The Hammer auction. U2 contributed two songs - Please and Sweetest Thing. A portion of the profits from the sale of Inspirations went to benefit the Nordoff-Robbins and Norwood Ravenswood charities for disadvantaged children and adults. Readers voted the song No. 7 in the Hot Press Readers' Poll for Best Single.